Service organizations have felt the emergence of the three components at varying degrees. Mobility has made the most impact, especially in field service. 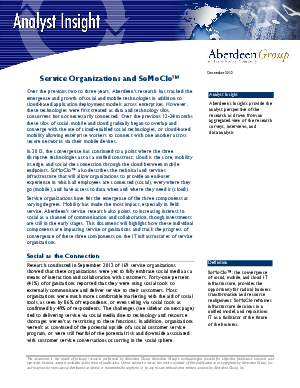 Aberdeen's service research also points to increasing interest in social as a channel of communication and collaboration, though investments are still in the early stages. This document will highlight how these individual components are impacting service organizations and track the progress of convergence of these three components on the IT infrastructures of service organizations.